Persons serving as command staff, section chiefs, strike team leaders, task force leaders, unit leaders, division/group supervisors, branch directors, and multi-agency coordination system/emergency operations center staff. Approved ICS-300 level training may be developed and conducted by Federal, State, Local and Tribal agencies as well as private training vendors. However, it must include the content and objectives stated in the NIMS National Standard Curriculum Training Development Guidance dated March, 2007. ICS Staffing and organization to include: reporting and working relationships and information flow. Persons who will serve as command or general staff in an ICS organization, select department heads with multi-agency coordination system responsibilities, area commanders, emergency managers, and multi-agency coordination system/emergency operations center managers. 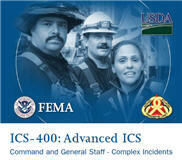 Approved ICS-400 level training may be developed and conducted by Federal, State, Local and Tribal agencies as well as private training vendors. However, it must include the content and objectives stated in the NIMS National Standard Curriculum Training Development Guidance dated March, 2007.